There are 200 new cases of multiple sclerosis diagnosed in the United States each week. MS is usually classified as an autoimmune disease. But really, the jury is out on how or why people get MS. We do know that the myelin sheath surrounding nerve cells is affected as the malady progresses. That is but a symptom. Causes are harder for Western science to understand or find. The typical result of MS is a weakening of muscles that obviously leads to immobility. Since MS manifests as deterioration of the nerves, there is very little of the body’s functions that isn’t affected. As with so many diseases, Western medicine does not understand a cure. Doctors will tell you that nobody gets over MS. They’ll say MS doesn’t go away like a cold or flu or even some cancers. I’ve lost count of how many times doctors are wrong. 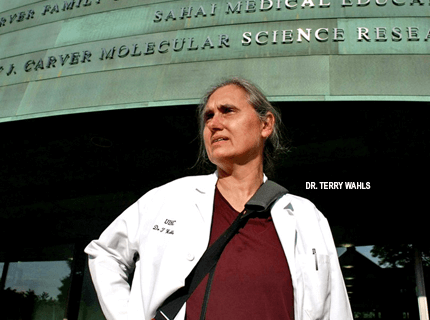 Terry Wahls is a medical doctor at the University of Iowa. In 2000, she was diagnosed with MS and her physical functions declined rapidly. Seven years into her decline, already confined to a wheelchair, she changed her approach. She reasoned that reinforcing her body with nutrient-dense foods and eliminating as many toxins as possible, she would be giving her body the best chance to recover. A year later, she was out of the wheelchair and riding a bicycle regularly. Paleo Shmaleo What Dr. Wahls developed was a variation on the trendy and popular “Paleo Diet.” That diet, as characterized in mainstream media, seeks a basis in what our ancestors of the Paleolithic era would have eaten, according to lore. The Paleo diet does away with processed foods in general and blacklists wheat (thus is gluten-free), starchy vegetables and legumes and dairy. The Paleo diet emphasizes animal protein, eliminates refined sugar and alcohol. It is often characterized as a “forager” diet, assuming that cavemen were even more foragers than hunter-gatherers. There is a general impression that the Paleo diet is a meat-centric one. It isn’t at all. In fact, it is very plant-centric, emphasizing dark green, leafy, nutrient-dense vegetables, fruits of wide colors and crucifers. Critics of the diet rightly point out that we have no way of really knowing what a Paleolithic human ate and that the period lasted so long (2.5 million years) that the diet had to have evolved over time. That criticism is somewhat of a red herring. If anything, the primary detraction of the Paleo diet is that it suffers being poorly named. There is nothing wrong with eating a nutrient-rich diet that avoids modern wheat and grains, processed foods and dairy. And the Paleo preference of eating organ meats such as liver and heart carries out the general directive of emphasizing nutrient-dense choices. False promises need not mean faulty premises Wahls implies she reversed the effects of MS. Make no mistake, MS does indeed display a pattern of remission in most cases, only to reappear in a progressive mode. Wahls’ MS has been in remission for a long time. She has documented her protocol in a couple of books that appear to sell well online. Any casual visitor to the websites promoting the Wahls protocol would recognize the commercialization of what may indeed be a good idea. And Wahls does appear to project the impression that a solution to MS is available via the protocol. But she stops short of promising a cure or claiming a result. A “protocol” like Wahls offers has to be looked at not as a cure or a cookie-cutter recipe for healing. The important message to take from anything like the Wahls protocol is that 1) the human body has an infinite ability to heal. And 2) It will always make sense to follow a natural course of eating nutrient-dense, unprocessed and unadulterated foods. And to do that radically if we want to see radical change. While the fervent adoption of any of the trendy, radical flavor-of-the-month diet schemes is off-base, eating real food is always advisable. It is very easy to overlook how many chemicals, unnatural additives and neurotoxins we consume or absorb. For example, many people reject tap water and opt for bottled water or a faucet filtering system. Few people realize that our greatest exposure (by far) to the chemicals we seek to avoid by drinking purified water is actually in the shower we take every day. We absorb much more chlorine, chloramine, fluoride, trace pharmaceutical drugs and other toxins from the vaporized water entering our lungs and through exposing our skin to treated and toxic water during a shower. So trying to drink clean water but showering in unfiltered water is flawed logic. Wahls is treading closely to the edge of offering false hope or suggesting a cure, though seeming to deftly skirt verbiage that would claim that. Still, the basic idea of respecting the natural healing ability of the body while recognizing how skewed our typical dietary habits are is the point that should be taken away from such a discussion.